Pebble Beach founder Samuel F.B. Morse was a staunch environmental conservationist who treasured the Del Monte Forest. His top priority was to protect and preserve the natural beauty of Pebble Beach. Nearly 100 years later, Pebble Beach is a wildlife playground living harmoniously with residents, golfers and tourists alike. The rocky coastline is covered in sunbathing seals and sea lions. The skies are patrolled by cormorants and pelicans. Whales and dolphins showboat just off the shoreline. Deer graze carefree within chip-shots of people. Stops on 17-Mile Drive are even named Bird Rock and Seal Rock. There are more than 180 species of seabirds and shorebirds that call the Monterey Bay National Marine Sanctuary home. You’ll see an array of gulls, cormorants, and pelicans hovering above the coastline, as well as the Common Murre, Sooty Shearwater and Sanderling along the shore. And you’ll find plenty of birdies on The Links at Spanish Bay, the result of one of the most extensive and ambitious programs ever designed to blend public access, recreation and environmental habitat restoration. Fanshell Beach is actually closed from April 1 to June 1 for Harbor Seal pupping season. But you’ll usually see Harbor Seals lounging around Bird Rock. Harbor Seals share Bird Rock with the belching California Sea Lion, a boisterous mammal that can be heard throughout a round at Spyglass Hill Golf Course. The endangered California Sea Otter hangs out off the 18th hole of Pebble Beach Golf Links in Stillwater Cove. 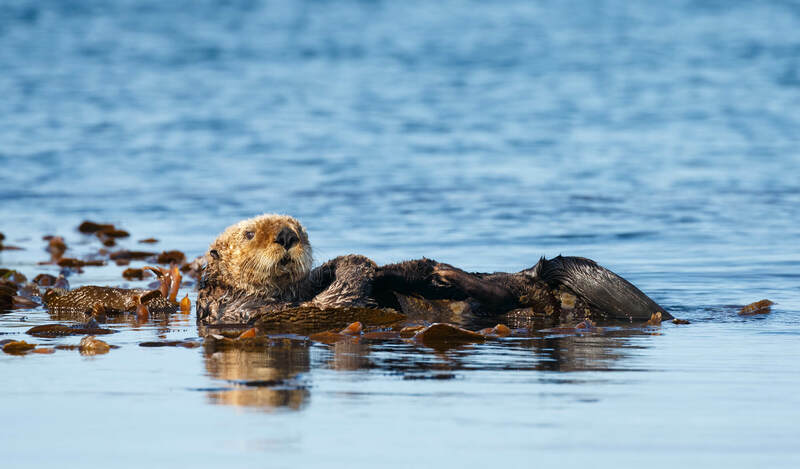 There were just 50 California Sea Otters in 1938, but today the population has rebounded to nearly 3,000. The Monterey Bay is a hotbed for whale watching, with its unique and cavernous 2-mile deep underwater canyon that is ripe with plankton and algae. December through March is prime time for California Gray Whales, while April to December is peak season for Humpback Whales and Blue Whales. And if you spot the puff of a whale spout, its likely a pod of dolphins or Killer Whales is tagging along. The Blacktail Deer are the largest herbivores native to the Monterey Peninsula. You’ll see them most frequently at dawn and dusk when they are searching for food, which is often on a golf course. What animals have you seen along 17-Mile Drive?